Some of our customers are new to PayPal and shopping online. Here’s a step-by-step guide to what you can expect from this site. 1. Visit our SHOP and find the pattern you would like to buy. 2. Click the Add to Cart button under the item. Now view your cart from the link next to the button or from the “Your Cart” link in the menu. 3. After you have viewed your cart, hit the “Proceed to Checkout” button. 4. Fill out your name and e-mail. (These are the only REQUIRED fields.) And press the “Proceed to PayPal” button. 5. You will be asked to sign into PayPal. If you don’t already have a PayPal account, you can quickly create one for free. 6. Complete the PayPal process. All of your payment information will be kept safe and secure. 7. Once you have paid, PayPal will automatically redirect you to a page on the Miss FITZ website. This page will give you the specifics of your order and allow you to download your patterns. You will also receive an e-mail. That e-mail will contain an order summary and links to your downloads. Simply click the link and the download will be automatic. 8. 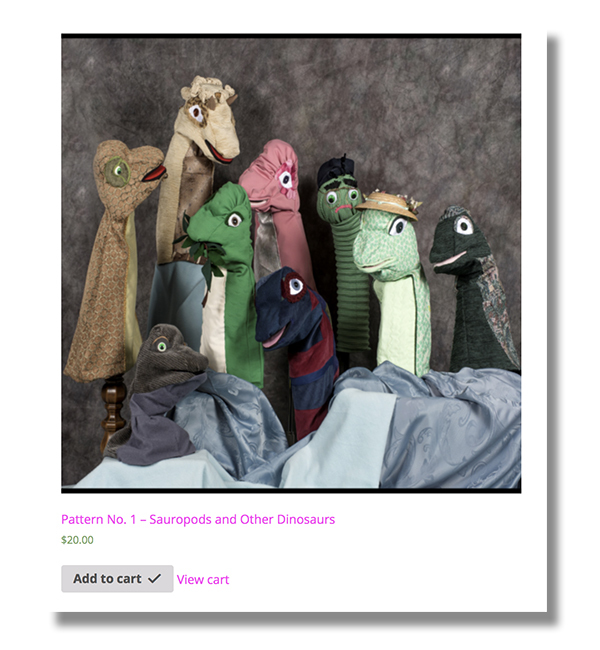 Enjoy your patterns and the puppet-making process. Be sure to contact Miss FITZ if you have any questions or concerns.